Temple Tree Langkawi is one of the most delightful boutique resorts we have been privileged to review. Within the eight grand villas of Chinese, Malay, Indian, Arab & Eurasian origin, are twenty unique & luxury suites. Combined with the intimate dining at Straits Club and two long swimming pools, it is a relaxing escape and conveniently located ten minutes away from the airport and set back enough from the main thoroughfare that you feel you are in the isolated countryside. Our arrival and check-in was quite late and probably the last guest to arrive for the evening, but the manager was waiting for us and gave us a very personal and warm greeting. We were then duly escorted and introduced to our new house for the next three days - the black and White House from Negeri Sembilan. YES! We had a whole house to ourselves without having to share the common area eg: the living room with other guests in the other seven houses accommodation. Temple tree houses are beautiful remnants of colonial Malaysia, an era when the architecture styles of many different races featured prominently. 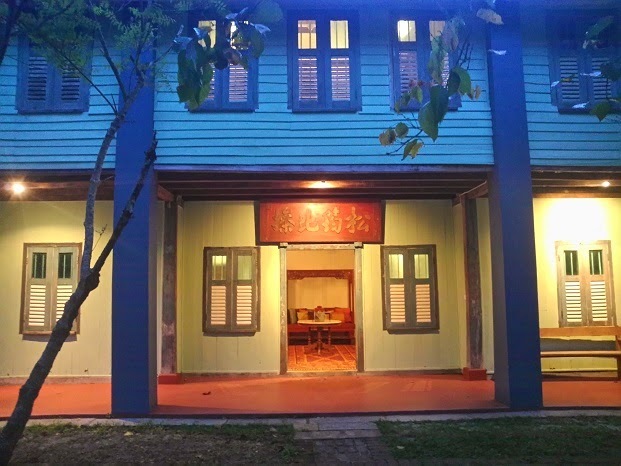 It’s beautiful antique wooden houses are sourced from all over Peninsular Malaysia. 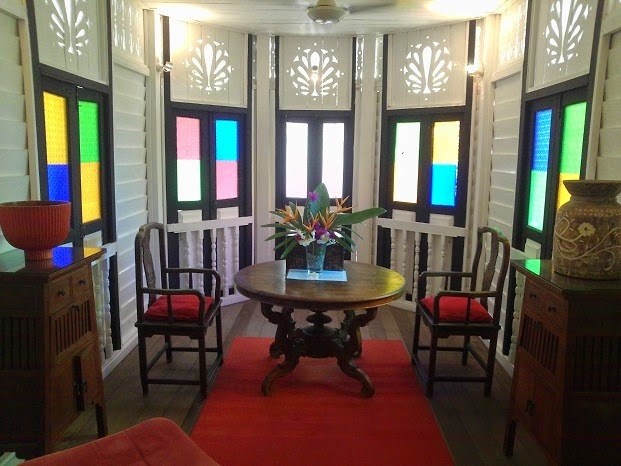 The houses are as old as 110 years and are constructed of rich aged timber, featuring original touches, such as heavy hanging double doors and intricately carved wooden panels. The wooden houses are acquired and transported to the property and restored one-by-one for the resort. The structures have now been preserved for future generations and from the outside, it is an imposing heritage house with beautiful details that you do not see in modern houses, but inside we were overjoyed to have such comfortable quarters with some carefully picked furniture mixing of modern and period elements design details contrasting the interior by giving a real feeling of a home. 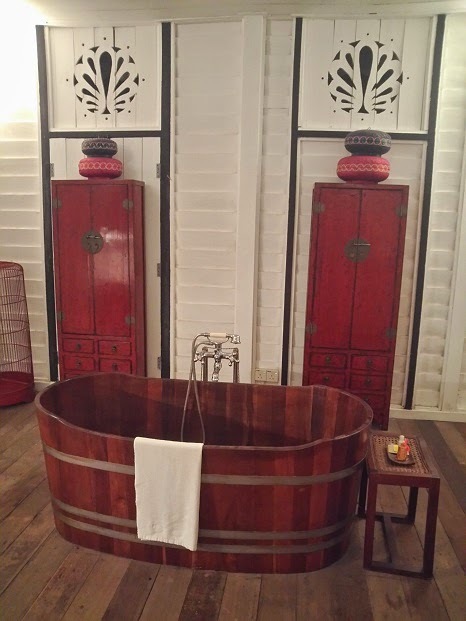 The double shower and basins in our bathroom are very much appreciated and the freestanding wooden bathtub in the bedroom is also a nice added touch. The spare bedroom means that this house really can sleep a family of four comfortably and plenty of drawers and shelves for unpacking your suitcase. The interiors are inviting, particularly the high pierced woodwork window screens letting the air and light circulate from outside and within. Without affecting your comfort, air-conditioning systems as well as multiple ceiling fans are installed for greater relaxation. 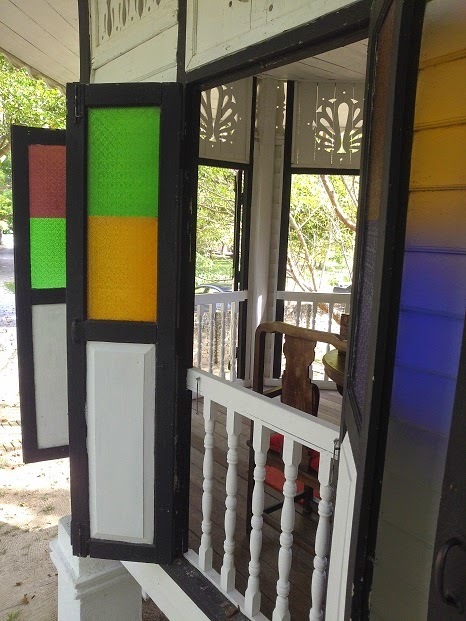 With a nod to local elements, a mosquito net is set around the bed, a shower that drains through the floorboards since the house is built and raised above the ground, carved wood panels, plantation-style shutters, color-stained glass windows and a large balcony at the house entrance. The windows look stunning in the sunlight, open or closed and the first thing you want to do when you arise is fling them open! A continental breakfast is delivered to your room the night before, so no need to set the alarm to make breakfast like you do in most hotels and resorts if you want to sleep in, so you are at leisure to eat whenever you want (the selection may not appeal to everyone, but that is always a game of chance in any resort and this one just decides that if guests want more, they will need to head out). 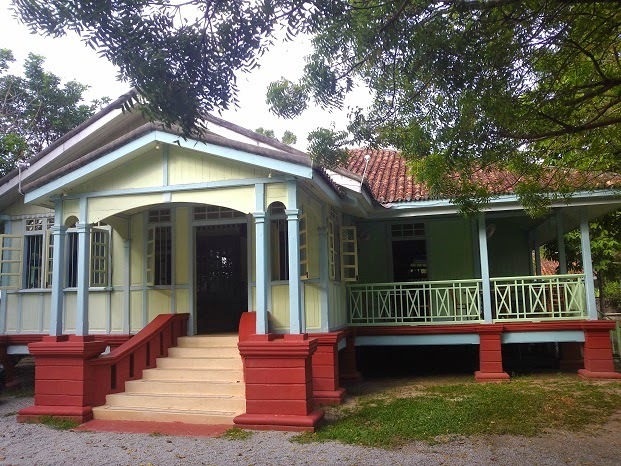 Walking around the resort gives you the feeling you have walked into a fabulous museum with authentic, beautifully maintained houses from the early 20th century, with a few updates and mod-cons. There is no sense of time standing still though or look but don’t touch attitude, as everything is meant to be utilitarian and to be enjoyed at all times. In fact, you feel compelled to spend time enjoying yourself, sitting having a cup of tea or glass of wine in the sitting room, or lazing by the fabulous pool, because the surrounding environment is so agreeable! The rustic and raw design long swimming pool is surrounded by quite a spread of well molded grass, overlooking the second highest mountain in Langkawi where the cable car ride attraction is located with more than enough supply of sun bathing lounge chairs and umbrellas parallel aligned to each other. Honestly, we would love to own this house! That’s the wonderful feeling we had throughout the stay, treat it like your home and it could be your home. The staff are always accommodating and think about your needs at all times. In short, an experience that is so unique and really does have a point of difference that we urge anyone looking for subtle luxury in a ‘recycled’ way to book this resort. Who would think of relocating and preserving entire houses for guest accommodation? 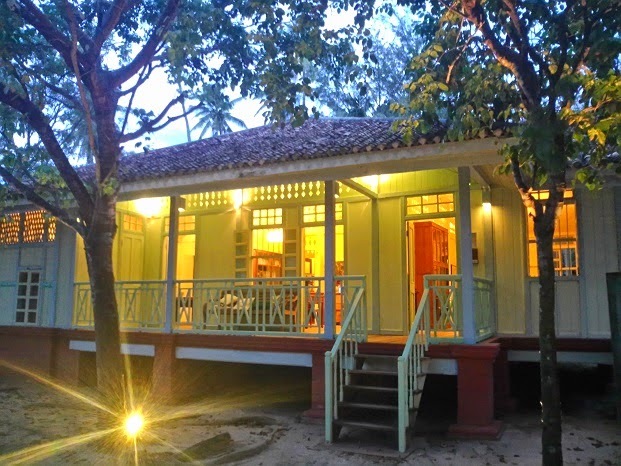 Make this your destination in Langkawi for a stay that has charm and size to deliver on all fronts! 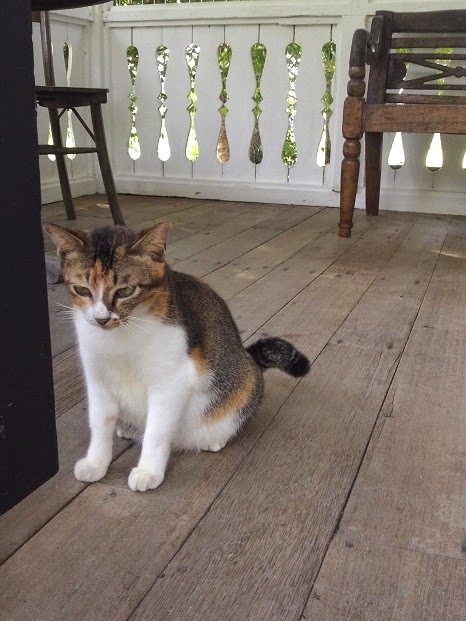 Temple tree promotes heritage conservation and provides funding for LASSie, the Langkawi Animal Shelter and Sanctuary Foundation. Stray cats are adopted and can be founded everywhere on the estate. 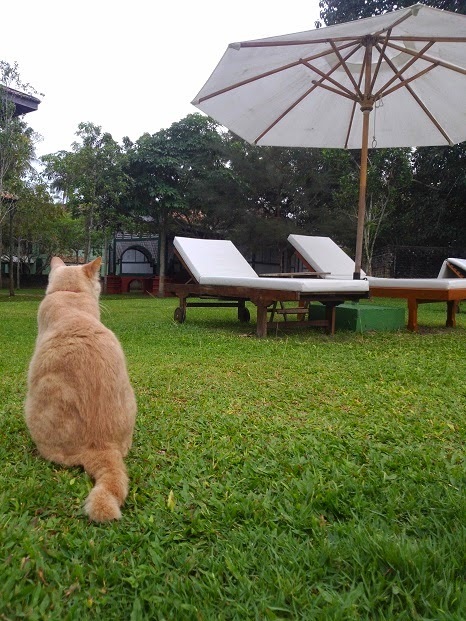 Do not be afraid by making new friends during your stay as they are so adorable to be with, you may even want to bring them home adding one or two new company to your family.